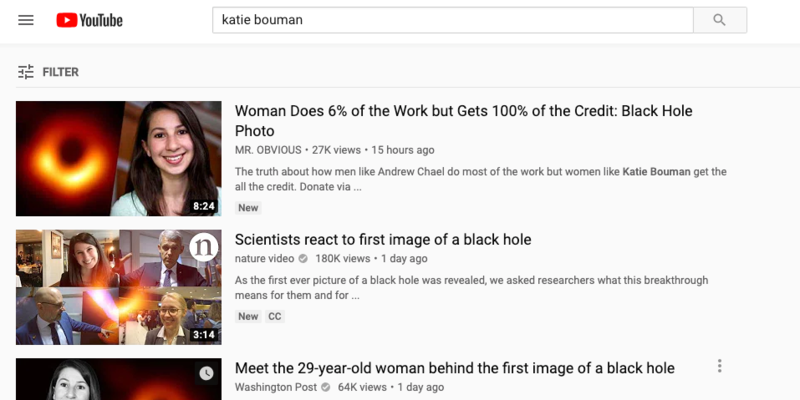 Until earlier this afternoon, searching Katie Bouman's name on YouTube brought a sexist conspiracy theory to the top of the results. Katie Bouman, who helped capture the first image of a black hole, has become the target of misogynistic conspiracy theories online. As news spread of Bouman's work on developing an algorithm for the Event Horizon Telescope team, some people on social media and YouTube promoted a conspiracy theory that another male developer on the team, Andrew Chael, did significantly more work on the process. Despite Andrew Chael's public denial of the theory, a YouTube search of Bouman's name put a video promoting the conspiracy theory and accusing Bouman of stealing credit for the project at the top of the results. 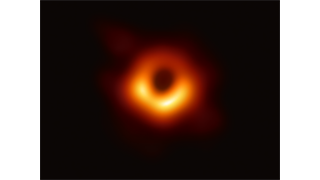 As news of Katie Bouman's role in capturing the first image of a black hole went viral earlier this week, another group was creating its own version of the story that accused Bouman of profiting off the hard work of a male colleague on the Event Horizon Telescope team. That false narrative quickly found its way to social media and YouTube. Earlier this afternoon, people began to notice that the top result when searching Bouman's name on YouTube produced a video by a user named Mr. Obvious. 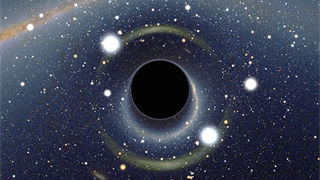 The video, titled "Woman Does 6% of the Work but Gets 100% of the Credit," said that a man named Andrew Chael had personally written 850,000 lines of code for the Event Horizon Telescope project, while Bouman wrote only a few thousand lines. Category tags for the video included "progressive agenda," "stole credit," and "truth about woman." A list of tags associated with the Mr. Obvious video. As the counter-story gradually gained momentum, Chael offered a public rebuke of the conspiracy theory on Twitter. Mr. Obvious' video was still the top result hours after Chael attempted to correct the false narrative, even as the YouTuber acknowledged that the basis of his video was untrue. Mr. Obvious said in the comments that Chael hadn't written 850,000 lines of code but remained inaccurate in his assumptions of how much work Bouman contributed. He wrote, "Apparently, Andrew Chael didn't write 850,000 lines of code and it isn't clear how many lines he did code, 500,000 lines are apparently pure data, leaving around 350,000 lines of code unaccounted for, if that were taken at face value it would mean she wrote like, 14% of the code, to be fair. Granted, this doesn't change the fact that 80% of the scientists involved were male. Still, I like to make corrections so there ya go." On April 12, a number of Twitter users began criticising YouTube for promoting Mr. Obvious' video. Eventually, it stopped showing up in the results. Based on a public statement released on Friday afternoon, the change came after YouTube added Bouman to its list of news-related search topics. In a statement released on Friday, YouTube said it's working to bring more verified sources to the top of search results when users search for news-related topics, which would also deprioritise borderline content such as Mr. Obvious' video. While the algorithm normally looks for the latest videos in a search, YouTube will prioritize verified news sources when the search topic has been designated as news-related. "We've taken a number of steps to address this including surfacing more authoritative content across our site for people searching for news-related topics, beginning to reduce recommendations of borderline content and showing information panels with more sources where they can fact check information for themselves," a YouTube spokesperson told Business Insider. "We've seen meaningful progress as a result and are committed to making more improvements going forward." 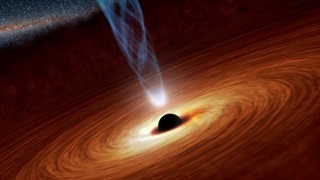 Astronomers just captured the first image of a black hole. Here are the horrifying things that would happen if you fell into one.